Family operated business serving New Jersey home buyers and sellers. 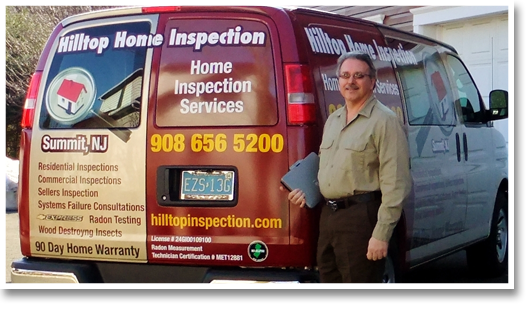 Hilltop Home Inspection is a family operated business located in Summit, N.J. I take great pride and satisfaction in being able to offer professional Home Inspection services to New Jersey home buyers and sellers. My goal is to provide you with the resources necessary to make an informed decision about the home you are about to purchase. The purchase of a new home is a major investment that will impact your life for many years. A professional Home Inspection will prepare you for the challenges of purchasing a home. It is important to keep in mind that new construction homes as well as existing homes can have defects that you may not be aware of. A certified Home Inspection will identify visible defects to the interior and exterior of the home and make specific detailed recommendations for corrective action in a comprehensive inspection report complete with photos. Always choose an insured licensed professional Home Inspector when purchasing a home. Also consider choosing a Home Inspector with “hands on” experience in building construction trades and practices. I have over 48 years of experience in residential and commercial building construction and maintenance. With todays economic environment forcing families to reduce expenses, property maintenance is often delayed or completely neglected. Protect your investment with a professional Home Inspection. When selling a home doing a sellers inspection is a valuable service. A sellers inspection will identify issues that require attention giving you an opportunity to be proactive and correct them, prior to the buyers inspection allowing you to maximize your homes value. I deliver the report over the Internet within 48 hours. I am fully committed to your complete satisfaction. A satisfied customer will result in future referral’s that I greatly depend on. I perform all inspections in compliance with the required New Jersey Standards of Practice. I have over 48 years experience in residential and commercial building maintenance and renovation construction. I have been a residential and commercial building renovation and maintenance contractor for 48 years. I am experienced in all phases of building construction, and the systems they use, and I will put that experience to work for you in my inspection. My expertise is the result of many years of live “hands on” experience in carpentry, plumbing, electrical, mechanical, masonry, and troubleshooting failing building systems. I have completed a 4 year carpentry apprenticeship program. I have a certification from the National Institute of Building Inspectors. I am a certified Radon Measurement Technician.